Echo Rivera (Research Associate, CPR) presented at the 2016 American Psychological Association convention in Denver, CO. Her presentation was titled It’s More Than Pretty Pictures: How to Use Graphic and Information Design to Disseminate Your Work. Regardless of our audience, the core goals of dissemination are the same: get people to pay attention, understand, remember, and use our information. When we do not achieve these goals, our work is more likely to be misunderstood, misrepresented, ignored, or forgotten—in other words, significantly less likely to produce the positive social change that we are striving for as researchers/evaluators. Yet, there is little formal training on how to effectively or creatively communicate research and evaluation findings. 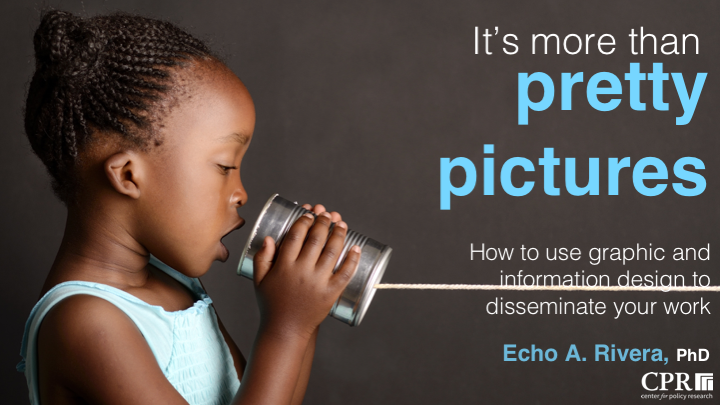 In her presentation, Echo shared some key best practices and strategies to share our work in ways that people can better understand, remember, and use. She focused on how to (1) apply key visual-based strategies to grab and sustain peoples’ attention in the midst of distractions, and (2) use visuals to help audience members quickly understand and remember new ideas.